As 2009 draws to a close, I find my perspective of the past two years to be quite an image of opposites… without appearing so at first glance. I remember sitting on New Year’s Eve 2007 with great expectations and excitement for the coming 2008. I was absolutely giddy for all that was to follow…. and it did not disappoint. We were booked on a cruise for my parent’s 50th anniversary with my siblings and their spouses. Our first trip without kids….. as adults. We were overjoyed. Early 2008 I was in the throngs of getting our first book published, my website up and book signings arranged. It was a whirlwind of activity…. and it did not disappoint. I still love my website, even though it desperately needs to be updated. The motherhood book was cuter than I could have imagined and the book signings were so much more than I hoped they could be. I was overjoyed. Looking at 2009, you would think my anticipation and responses would be nearly similar, as our second book was published and Rick and I again escaped to a cruise ship for five days… alone this time. There were plenty of book signing opportunities and speaking engagements to fill my calendar. But my summaries of the two years are not at all alike. 2008: thrilling, awesome, love to relive it all. 2009: emotionally draining, glad it’s over, can’t wait to start a new year. WOW! It makes me feel better just knowing that today is the last day of my most frustrating year ever. Why? you ask. It seemed that all things that I hold dear to my heart took a beating this year…. my family, friends, church and homeschooling. It was a year of trials, disappointments, changes and a realization that we were on the wrong track. That in itself is a good thing as we begin our new year aiming in a different direction. Sometimes I like change…. like the change from a $100 bill when I only bought a pack of gum. I also like change when it comes to dirty socks, sheets and past season flowers in my backyard pots. I don’t appreciate change when it comes to churches, friends, or finances. Typically I’m not an emotional wreck, but most of June I spent crying and hiding in my room. I read more Christian western 1850’s romances this summer than the past five years combined. Why? you ask. Because I needed to escape. I didn’t want to face the facts that were dumped upon me and our family. I didn’t want my life to change. I relished feeling secure in how things have been for years and there was a huge rock in the road that upset the apple cart. My apples were everywhere but in the cart for many months. I still don’t have them all gathered back. One thing we realized (remembered) is we are becoming who we surround ourselves with… and we needed to seek out others who were truly like minded with us in regard to our family beliefs with church and school. We slowly, over years, came to the place where we couldn’t even talk about our calling to teach our kids at home for fear of offending those we spent the most time with. Not that we are abandoning friendships of old, we just needed to be encouraged and prodded and slapped on the back by others who understand our calling…. our lifestyle of homeschooling. It truly encompasses all we do as a family. I haven’t come full circle with the challenges that arose, but I do see how the Lord has provided friendships for me along the way. Awesome women of God to come along side of me. God allowed challenges to force us to see the error of our ways and our need to seek His face. So, for that, and for the bumps in our 2009 road, I’m grateful. Supremely grateful they’re over! I apologise for my tardy posting of today’s winner of my fantastic book Laughing in the Midst of Marriage. Of course you have the privilege of hearing some entertaining stories before I announce the winner. On the way home from California yesterday, the highway was closed for several hours due to an accident and the 100 mile detour was not very tempting. So we after getting off the cruise ship at 9:00 am, we arrived home at 10:00 pm. It’s only supposed to take 6 hours. Bhhaaaaa! Anyway, glad to be home and that’s why I didn’t post yesterday. Today’s plans were to put up the real live Christmas tree in the family room for all of the precious handmade adornments that my children have crafted with their talented little hands over the past 16 years. Well, to make a long and agonizing story very short, we HAVE put up the $5 real live tree…. several times now. (It pays to wait until Dec. 19th!!!! It’s a nice tree!) Currently, however, it is leaning at a 40 degree angle and is propped up between the wall and the entertainment center. We have also picked up all the ornaments several times, shop-vacced the water out of the carpet and thrown away several glass ornaments that didn’t take well to being smashed to smithereens when connecting rapidly and repeatedly with the floor. This is so FUN! I can’t wait to do it again and again until we get it right. I’m ready to hammer an ugly nail into the wall and tie the tree up with a bright orange bungee cord. So, there was a slight delay in getting the names cut and folded for secrecy for the drawing of the winning name. We also needed eggs, milk, bread, bananas and cheese….. but I digress. Child #2 hand wrote all the names. Child #1 verified that he did indeed copy all of them correctly. I folded them all to improve the random choice. And child #3 chose the winning name. I bet you’re wondering who it was, aren’t you??? First one last bit of unimportant trivia from my day…. in the midst of the $5 Christmas tree fiasco (which is still not concluded) Besides the Christmas tree I also purchased petunias, lobelia, pansies and alyssum for my naked flower pots. Keeve and I yanked out all the summer vinca and he asked if he could transplant his peas to bigger pots or a plot on the ground. “Yes, of course, my little gardener.” We readied a huge cement pot with new dirt and moved some empty pots of his that didn’t sprout. Keeve sadly said, “A seed is not a promise!” as he moved the dirt filled pots. I previously read the story A Seed is a Promise to him. So cute! (and depressing when seeds don’t grow!) Well, the peas were planted in peat moss pots and the pea’s roots grew through the pots and down into the soil of my raised flower bed. BIG roots. Deep roots. So instead of transplanting, he just filled in the area with dirt and the peas will stay where they have put down roots. (I told you it was unimportant!) And the winner is Valeera, aka Gram. Congratulations. Please send me your address via email and I’ll send out the book. Please come back for more scintillating Christmas tree stories and heart-filled holiday trivia from our home to yours with love. Merry Christmas and Feliz Navidad! In the spirit of giving and Christmas, I’m giving away a copy of my new book, Laughing in the Midst of Marriage: Finding Joy in Being a Wife! Whooo HOoo! It is a devotional for wives of all ages, full of true life stories to inspire you and make you thankful for your husband. To enter just LEAVE YOUR NAME in the comments section. My contest committee will hand write them… hand cut them… hand them into a bucket… and hand select a winner from the pile. This is all done quite officially, really. The winner will be chosen on Dec. 18th late at night. So that makes the official cut-off time “when I get home on Friday night.” Good luck!! and God be with you!! Side note: this will be the only post this week until the winner is announced…. because for my Christmas present, my sweet hubby is taking me away for five days…. without children. Am I excited? YES!!! So, pass the word about the free draw and I’ll be back on Friday night. If you’re one of those people who never wins anything, you can buy the book at www.cbd.com and probably be reading it before the winner! 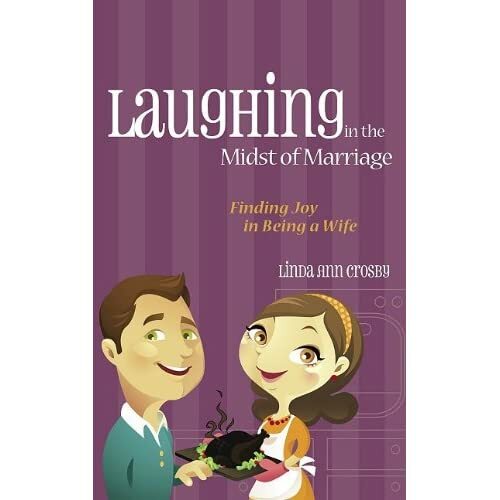 My second book came out last week titled Laughing in the Midst of Marriage: Finding Joy in Being a Wife. It is stocked full of humorous stories of married life guaranteed to bring a smile to your face. I finished writing the devotional in March… and funny thing…. I needed to re-apply some of the truths even before it was in print. Nice. As we’re all in the married process, we’ll continue to live, learn and laugh along the way. 3. Come to my house and save on shipping. Call first and I’ll have cookies coming out of the oven. 5. Buy books from my sister, Christy. She has a box of fresh ones sitting at her house. The books are $10.99 plus shipping of $2.20. (This is a MSJ discounted price! Oh My!) TOTAL: $13.19 US Funds. For multiple copies, please email me or leave a message here and I’ll cut you a deal on shipping. Thank you so much for your support and love. This is quite the adventure and I’m blessed that you are on this slippery ride with me! Hello Friends! I feel like Madame Blueberry singing her song, “I’m so busy, busy, dreadfully busy, you’ve no idea what I have to do.” It’s such a catchy, annoying tune. Too bad I don’t know how to video tape myself singing it for you. Scrapping in the Pines was fabulous as usual. Four days of resting, eating, taking walks (shopping counts in there! ), watching movies and chatting with the girlfriends. It comes at such a great time of year too, right after school and sports have started. Ahhhhhh. The soothing memories occasionally last for almost a month! It was an exciting time filled with centipedes, a skunk and Veronica’s four clothing changes per day. Highly amusing! My son, Austin, turned THIRTEEN on Monday. I’m officially a mother of two teenagers. I can’t be that old. He is slowly catching up to his sister (who has only grown 1/8 of an inch in three years…. ) and me. I’ve still got 5 inches on him, but it won’t last long. His birthday request was a street hockey game with his homees. It will be Friday night… pizza, hockey, cake and ice cream. Makes for a good teenage induction evening. Here is the most recent picture I have of Aus. My husband’s mother and brother are here visiting for a week, so there is more cooking going on and less homeschooling. But the visits are always full of laughter and good times. They are already all sunburned from extended pool time… including my children. How many times does a mother have to say, “RE-APPLY Sunscreen?” Oh well. 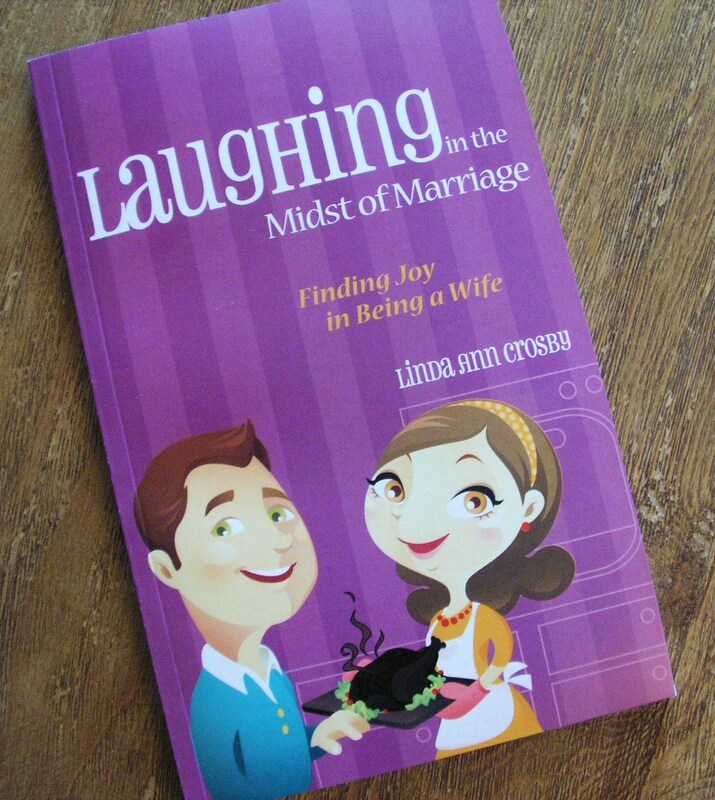 Exciting news is that my Laughing in the Midst of Marriage book came hot off the press yesterday! I should have a hot little copy in my hot little hand by Saturday! So exciting. This sort of crept up on me and I need to rock-n-roll to get it available on my website. When I told the kids that it came out, Larisa said, “Congratulations! You’re a published author.” And Keeve added, “Again.” So it’s not as thrilling as the first time, but thrilling nonetheless. I’ll be sure to post pictures of the cute little purple books when they arrive. Oh! And I need to go buy a cute little purple shirt to match!… or a cute little purple jacket… at least good purple jewelry. Any excuse to accessorize will work. No adoption news to report. Please stay tuned. I know I am. I’m gearing up for the D6 Conference in Frisco, TX next week. Not only do I get to speak, but I get to meet all the people at Randall House who work so diligently on my book! I’m so excited! And I just can’t hide it. I’m about to lose control and I think I like it. Like it. I’m also looking forward to seeing Tim Hawkins. He totally rocks my socks. He’s so stinkin’ funny. It’s not too late to join the festivities! www.D6Conference.com Sept 23-25 just north of Dallas. Come and be blessed. Good Grief! Where did this week go???? And There’s my hubby too… on the fridge. The list had more than 50 items to be done and on Monday alone we finished over 25! I was thrilled and exhausted. We have slowly accomplished more of them as the week has drawn out. The ones that are left require my husband to help…. or a task that I’m not exactly sure how to handle. Then if cleaning and painting and wiping weren’t keeping me busy enough, my book came back for me to proofread! So that was another day of not getting ready for school OR checking off items on the TO-DO list, but I’m glad that task is over. I’m officially done with my part of Laughing in the Midst of Marriage. It’s ETA is Mid September, I think. I haven’t actually heard a date, but I saw on www.christianbook.com that it is pre-selling with a Sept. date for shipping. Cool! So THAT is why I haven’t blogged since Monday. It’s not that I stopped having crazy things happen to me, or that I didn’t have strange stories to tell. B~U~S~Y with a capital B. Back to D6. Here are just SOME of the speakers for the three day conference: Jim Daly, Angela Thomas, Dave Ramsey, Mark Matlock, Darren Whithead, George Barna, Tim Hawkins, (ok, if he isn’t reason enough to go, please!!!) Renee Swope, John Trent,Rob Rienow, Kelly Rosati, Susan Sheppmann, and Linda Crosby. WHAT? Was that last name really on the list???? YES! Amazingly, this whole shindig is put on by my publisher, Randall House, and they asked me to speak and are promoting my new book, Laughing in the Midst of Marriage, which comes out minutes before the conference. I’m thrilled, to say the absolute least. I think I shared this preview cover before, but here it is again. They made it so cute! And yes, the turkey is burnt. Most parents want to be involved in the spiritual development of their kids’ lives. They just don’t know where to begin. Here’s help! COME to D6! Just had to share. :o) Excuse me now, I need to go pick up all of my buttons that are on the floor by my feet. Today, bright and early on this Monday morning, I received my edited manuscript for Laughing in the Midst of Marriage. I took one glance through the pages and had a flash back to college writing assignments. Let’s just say my editor worked for every penny they earned on this project. The red on the page is prolific. Once at TWU an essay was handed back to me with MORE red than black writing on it. Good grief! Written in big red letters across the top it said, “When in Canada, Write as a Canadian!” I didn’t realize there was a difference. Today, in America, I’m not sure who I’m writing like??? Maybe my editor is Canadian? I’m not sure. Anyway, I have pages and pages to go through of black and RED typing. I’m so thankful for someone who is trained to fix other people’s work. It makes me look and sound good. :o) The email said something to the efffect of, “Let us know if you accept the editor’s corrections.” WHAT? Like I know anything about correct grammar and syntax! I just love to spew forth on the page. If they said it’s right, they’re probably right and who am I to say otherwise??? So far my day timer has my week all lined up for me: B-day lunch with Cheryl, dentist, dog shots, adoption conference call, movies, sewing a Bag for Zaza and lots of reading black and red pages. Enjoy your start of a new week.